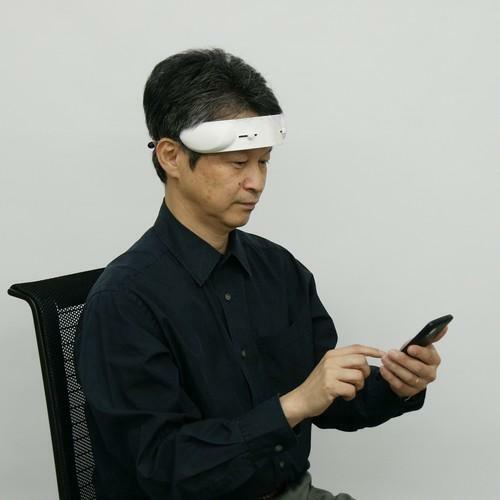 Hitachi High-Tech's forehead brain activity sensor works with a smartphone app to improve learning and memory skills. If you're looking to sharpen your mental focus, Hitachi has developed a wearable brain activity sensor designed to improve learning skills. The prototype, which looks somewhat like an old-school telephone handset, covers a user's forehead and works with a smartphone, according to Hitachi High-Tech, a group company. While it isn't exactly discreet, it only weighs about 100 grams. Since it has no external power cables, it can be worn while doing daily activities, instantly showing feedback via the smartphone. The headset emits near-infrared light at both sides of the forehead to measure blood volume changes in the cerebral cortex. The changes are associated with activity in certain brain areas and are analyzed by signal-processing circuits in the forehead unit. After analysis, the data are displayed on a Bluetooth-linked Android smartphone so users can see what their brains are doing in real time. The headset is designed to help in applications such as "cognitive training and learning," according to the company. It could be used in conjunction with smartphone games such as quizzes and memory puzzles. "Since the prototype shows brain activity in real time, it could be used for rehabilitation purposes, for example," a spokeswoman said. "This is designed to be a compact device for general users, not something special for gaming or medical purposes." Hitachi High-Tech's bread and butter is semiconductor manufacturing equipment and measurement devices, but it turned to brain sensing after acquiring the blood volume sensing technology, dubbed optical topography, from parent Hitachi in April. The electronics and home appliances manufacturer collaborated with toy maker Bandai to launch BabyLabo, a toy for infants based on brain activity measurement technology. Hitachi High-Tech wants to continue tests on the headset with universities and research centers. It plans to begin commercializing it in 2016 with an eventual sales goal of 1 million units by 2020, the spokeswoman said. While the company hasn't decided on details, the headset could sell for around ¥10,000 (US$85) to ¥15,000 apiece, first in Japan and then overseas. That would make it significantly cheaper than Canada-based InteraXon's Muse headband, a $299 electroencephalography (EEG) device designed to help users de-stress. Japanese carmakers have also developed brain activity sensors in recent years, experimenting with them as controllers for wheelchairs and robots.